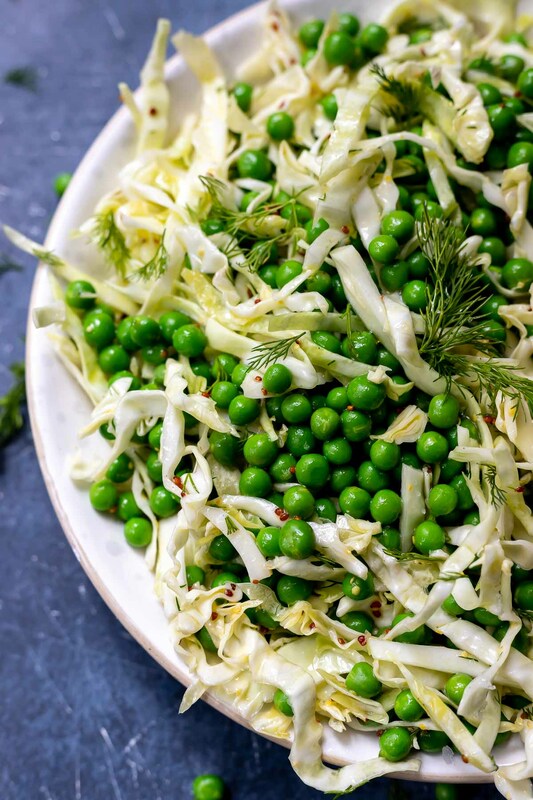 This English Pea Salad Recipe is just what we need to get Spring started and perfect for your Easter meal. 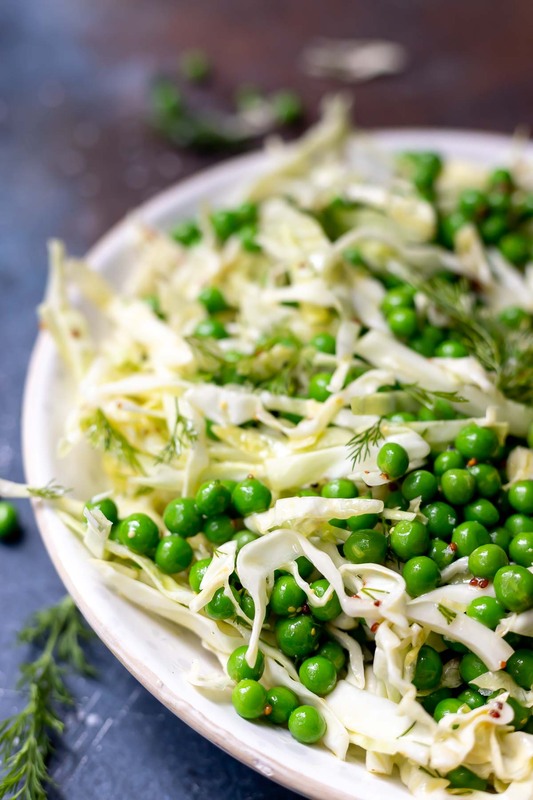 Fresh green peas, shredded cabbage and a tangy dressing make this salad healthier than classic creamy pea salad made with mayonnaise, bacon and cheese. This green pea salad with vinegar dressing is a lighter version of the classic pea salad that is drenched in mayo. 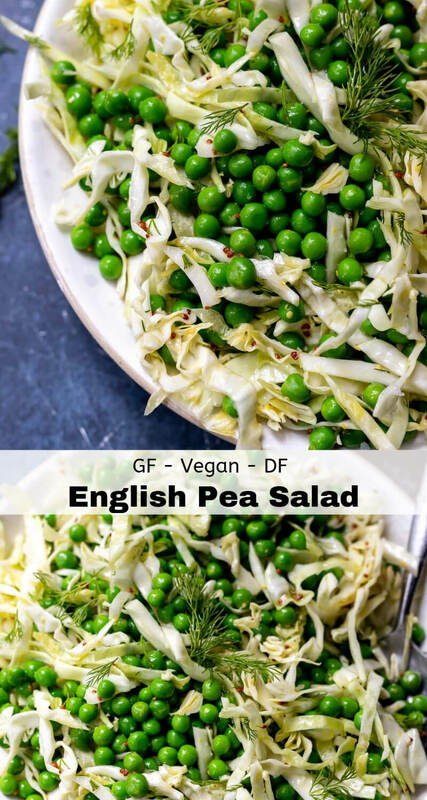 Just fresh green peas, cabbage and a tangy vinaigrette make this vegan pea salad simple and healthy. You won’t even miss the bacon and cheese! I prefer to use fresh green English peas. Just pop them in boiling water 1-2 minutes then rinse with cold water and they are ready. If you don’t have access to fresh peas, you can use frozen peas. You can’t achieve that great crisp texture with frozen peas but the flavor will still be great. Just thaw frozen peas and allow all excess liquid to drain. This easily lasts 4-5 days in the refrigerator. 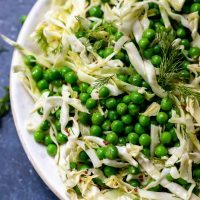 This pea salad recipe is great for a make-ahead side dish because it actually tastes better if the flavors can blend overnight. 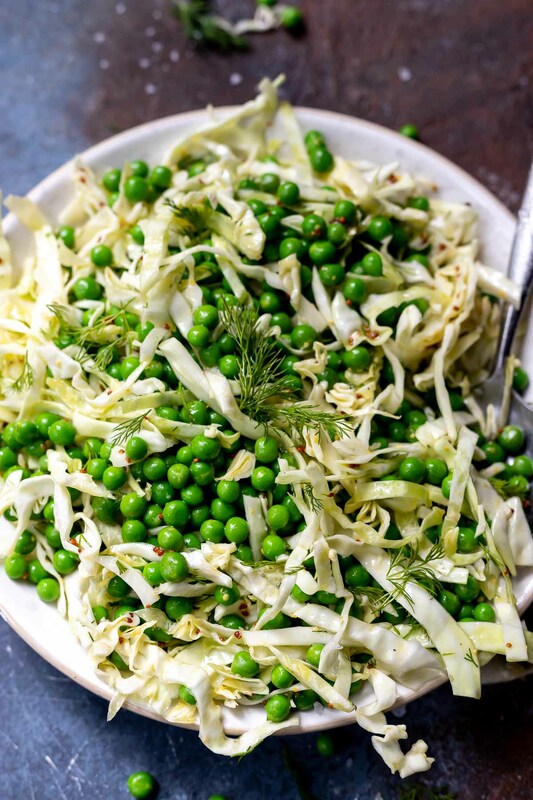 This pea salad is great for an Easter or holiday feast. Here are a few holiday recipes to serve alongside: Orange Honey Baked Ham, Pineapple Honey Glazed Ham, Ham and Cheese Puff Pastry Bake, Maple Roasted Beets and Carrots or 30 Minute Easy Dinner Rolls. This also works well as a Spring/Summer barbecue or picnic side dish. Drop fresh peas in boiling water 1-2 minutes then immediately rinse with cold water. Remove cabbage core then shred cabbage. Combine peas, cabbage and dressing. Refrigerate and serve cold. If using olive oil, take salad out 30-45 minutes before serving to allow the oil to warm and thin. Bring water to a boil in a 3 qt. pot. Drop fresh peas in boiling water 1-2 minutes (to desired texture) then immediately rinse with cold water. Combine oil, acv, mustard, salt, pepper and fresh dill.